This may be confusing, but this blog was created using several articles I had written over the past few years. You will note that they are dated. My goal in setting this blog up was to have all of my RV electrical and solar articles here where they would be easily accessible. When you read in one of these that you can e-mail me & I will send you the RV Battery Charging Puzzle, please understand the context. That statement was made in that particular article posted on a discussion forum some time ago. The RV Battery Charging Puzzle now has it’s own page in this blog, so look there. The following are offered in chronological order as a way of explaining how I got to where I am today. Still angry and justifiably so. This statement added in 2014: People seem to think that the system problems I reported on are the only ones I have. They are the extreme examples, but not so; I could go on & on for a thousand pages. Just this year some old friends bought a brand new camper and brought it to our property for me to look at. It had a brand new NO-Power solar system installed by the RV factory that was installed just like the idjits were doing over ten years ago. Their batteries got deader every day while the controller above the fridge kept saying 100% and they were using nothing but a couple of lights and a fan. I proved this with a hydrometer. Yes, I fixed it. No, I didn’t bother to call the factory to complain. I have tried that before. It doesn’t work. I am sick of hearing “We’ve been doing this for years and it works great.” Closed minds drive me up the wall. How about this revolutionary idea: If you want to know how to charge a battery, try looking at the battery manufacturer’s recommendations instead of believing the charger manufacturers. On Trojan’s web site you will find that they recommend a 14.8 volt daily charge, not 14.4 like everybody else will tell you. They also say to continue charging at that voltage until a specific gravity test shows the battery to be full, not to shut the charge off immediately or even early like most chargers operate. Interstate will tell you similar things. The popular opinions on charging AGM or other sealed batteries are also wrong. Every charger I have seen, as well as every solar charge controller is set too low. I have heard people say that this last .4 volts is insignificant, but they are very wrong. Oh, you can charge at 14.4 volts if you are plugged into shore power for days, but running the generator for a few hours or having your solar controller shut off as soon as it reaches the set point does not work. Then, the “professional” RV manufacturers and solar installers will use too small or too long of wire and guarantee that the battery never sees enough voltage to actually get charged. Plus, the Link meter has a factory default full setting of 13.4 volts, so it tells you your batteries are charged long before they really are. Why things are this way is a mystery to me, but this is why most RV & solar systems do not work very well. You would think that manufacturers in related industries would talk to each other, but it does not appear to be the case. I get blank stares from the RV solar dealers that I have asked about these facts, or they start to argue, so the solution is not to be found with them. One guy (one of the most respected RV solar dealers around) last winter actually told me that a hydrometer was not a good way to check a battery’s charge. What an idiot! He was lying so his installations would look better to the uninformed and he would get fewer complaints. I had bought six controllers from him in the previous few weeks and there he was denying the truth! I’ll take my future business elsewhere. When I found Trojan’s info was when I started to figure out how to make my solar system work. I now charge my batteries to 14.8 volts & then float them at 13.5 volts, unless my temperature sensor automatically lowers or raises this. I have been full timing (mostly boondocking) for seven years and boondocking exclusively for the past five years, never been plugged in at all and we have NEVER owned a generator. (We also do not own either an inverter charger or a pure sine wave inverter. See November 2008 update below.) Our 345 watts of panels runs everything we want and I do mean everything. Coffee maker, hair dryer, toaster, waffle iron, the electric iron that my wife uses for quilting, power tools like a table saw and big air compressor for powering nailers that I am now using while working on a friend’s off-the-grid cabin site. We have enough power that I can continue to work on cloudy days. It snowed here in Montana two weeks ago and my reaction was to tip the panels so the water would run off as the snow melted when the sun finally came out. My Trojan T105 batteries are over five years old and last winter while I was working on a friend’s solar system I disconnected my system for four hours and ran jumper cables over to his abused batteries to try to get them back in shape (it worked). After four hours of still running the small loads in my rig and putting all of my charging into the friend’s batteries my Link did not show 12.7 volts like everybody will tell you is full. It showed 12.85 volts! THAT is a really charged and really healthy battery. The majority opinions on batteries & charging are wrong. I am living proof of that and the fact that over 95% of the solar systems I have evaluated do not work well also bear it out. Somebody once attacked me on this forum and said that I should not say things about people that lead a more “robust” life, as if sitting in front of a computer and responding to every query, whether you know what you are talking about or not is more robust that running my power tools on my solar power and actually accomplishing something. So, don’t bother to attack me. I won’t respond. I will continue to live by example and help anybody with an open mind that is willing to listen. Send me your e-mail address and I will respond with a 16 page long rant titled “The RV Battery Charging Puzzle” that will tell you why what you have doesn’t work and what you need to do to make it work. But be patient, I usually only do e-mail on weekends and depending on the access, sometimes not even that often. 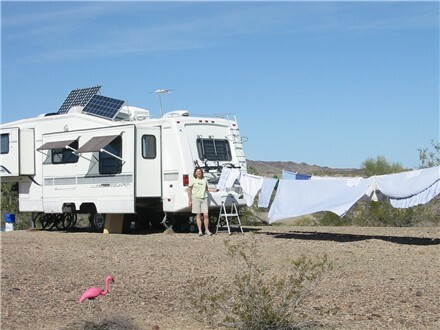 Let’s see if I can explain my view of what is going on in the RV solar industry by using an example from my former life. I was a lighting sales rep in the commercial/industrial world. The first thing you need to know is that lighting reps are viewed as one step down from used car salesmen and are expected to be dishonest. I once attended a training school at one of the factories, where they attempted to teach basic lighting design to former shoe salesmen (a real challenge). My background was engineering, including lighting design, so this was a waste of time for me, but it did prove interesting. The instructor handed out a sample office plan with some basic parameters listed and asked us to calculate lumens, foot-candles and the number of light fixtures needed. He then asked “What is the correct number of light fixtures for this office?” When we turned the hand out over, the answer on the back was “The correct number of fixtures is as many as you can sell.” In other words, take advantage of the customer’s lack of knowledge if you can and make more money. I didn’t work for this factory for very long. Their corporate policy conflicted with my views and I just couldn’t live with it. There were plenty of other companies that took the view that the correct number of light fixtures would be what would work well, making the customer happy and that happy customers are repeat customers, so I resigned that company and found another. I am on the outside looking in, but I believe that if you were a fly on the wall at some of the sales training going on by the major players in the solar business today, you would find something similar going on. The correct number of solar panels is “as many as you can sell”, and use your imagination to find ways to sell them. Why would you take advantage of someone in an motor home and convince him that he needs 800 or even more watts of solar panels and a boost controller that would run a house, when you know he doesn’t need it and that it will spend most of it’s time just floating the batteries and shutting the power off? Or, why install wiring that is not capable of carrying the voltage and/or not setting the voltage high enough so that the energy a system is capable of producing never gets into a battery bank, so that the customer comes back next year complaining that he just doesn’t have enough power and you get to sell him more solar panels? Or, why sell someone a boost controller that costs three times as much as another very reliable & proven controller that would work just fine in the application? Or, why sell someone a cheap boost controller and load it to 100% or even more, knowing that it will shut the expensive power the panels produce off in an effort to protect itself from burning up, and so it will not be boosting, no matter what the meter says? These things are happening on a daily basis and the answer has to be either “To make more money” or “because they don’t know what they are doing”. Take your pick, but isn’t one is just as bad as the other? If this were a safety issue, the government would have been involved long ago. Last year down south where many of us full timer’s winter, one of the bigger and more respected solar dealers became a dealer for the biggest manufacturer of boost controllers. He still had a stack of the very reliable old technology controllers in plain sight behind his counter (I bought five of them), but if you asked for one he would immediately go into a very aggressive pitch about the latest technology boost controller and tell you that “You won’t be happy with that old one and will be wasting your money on it. It won’t get all of the power your panels put out into your system. You’ll get 25% more power with this new one. I just want you to be happy.” (The factory says “up to” 25% because the truth is far less, but the dealers seem to ignore that qualifier.) While he was making this pitch, his installers were out in back, happily installing under wired systems with shadows on the panels from vents & air conditioners and leaving the voltage at the too low factory default level on every single one of them, so that the power really wouldn’t get into the systems. These actions speak volumes to me. I once tried to have a conversation with this guy about the Trojan Battery Company’s 14.8 charge voltage recommendation that he was ignorant of. He gave me a dumb look and said that the factory settings were close enough. He also refused to stock the temperature sensors to go with the controllers I had been buying. This dealer is not in the power generating business, he is in the money generating business. None of the systems he installs work to their true potential, and he has a good reputation. Sad. Do you want me to tell you about the really bad dealers? Before any of you says that profit is not a dirty word, think about what I said. I didn’t accuse the guy of making a profit. I accused him of being dishonest and cheating the customer in order to make more profit, which is exactly what he is doing. There are many RV solar dealers doing business like this. It is the rule, not the exception. As I have said time & time again, if these dealers really knew what they were doing and believed in it, they would be running both their home and their business on solar power. Has anybody ever seen one?? I have not. Even the reputable dealers are on the grid. I really wonder about that. I’m not in the business, but I’ve been off the grid in an RV for seven years and do just fine without a generator. I have had the same 345 watts of panels on our present rig for five years and have figured out how to go from a worrier who was afraid to turn anything on, whose batteries were never charged with those panels, to the guy that has not been plugged in for over four years, who runs all his power tools and whose wife runs her electric iron & sewing machine while watching TV on rainy days. Figuring out how to do so proved to be very challenging and took me several years, because I have never found a source for reliable and truthful design information. I did this by rewiring three times, moving the controller, buying a real meter and going through four different controllers. Nobody in the business talks about voltage, when it has proven to be the most important part of the puzzle. I have gotten bad advice at every turn, wasting a lot of both time & money and this is what has me so upset with the solar power industry. You can count the ones who know what they are doing on the fingers of one hand and I think I’m being generous. My experience in evaluating, working on and adjusting dozens of systems in the past three years tell me that there is indeed a great big difference in the power that goes into the batteries if you turn the voltage up to 14.8 volts (at the batteries, not at the controller) instead of leaving it at the factory set 14.2 volts, which usually nets under 13.5 volts at the batteries, resulting in a 50 or 60 % charge level when the full light is blinking. Most manufacturers of chargers seem to have no idea how to charge batteries and do not recognize what a big problem voltage drop is with even short wiring runs. Plus, there is an even bigger difference to be made if you buy a real charge controller that was designed to run a house instead of one of the several little flush mount types that most everybody buys, that were really designed to trickle charge one or two batteries. They all shut the power off too soon. One company even brags about their “gentle finishing charge”, which is their way of saying that they taper the power off before the batteries are fully charged. It is the difference between a system working and just “sort of” working. There are many RV’ers no longer running generators who think I am a magician, but after spending years of experimenting in figuring it out, I now believe it is just common sense. Now, you can all have your discussions about this. I’m not going to comment further. Any of you that disagree & can’t see what is going on have your heads in the sand. Can I run __________ with solar power? You fill in the blank. I’ve been asked everything & my answer will surprise you. If it is an electrical appliance that you have in your house or RV, the answer is yes (including the RV air conditioner up on the roof or even the heater). However, you have to buy the inverter, batteries & solar panels to put the power back in & some things take a LOT of power (kilowatts, not watts). That air conditioner would take at least two solar panels charging all day & batteries storing that energy, for every hour you want to run it. I once read in a bus conversion magazine that you need 2000 watts (about 20 panels) plus a generator to run a bus. Obviously, that author was no solar expert. You tell me; where would you put twenty panels & batteries on a bus, assuming you can afford them? It is not practical to run everything, even though it is possible. On the other hand, a CPAP machine takes less than the output of one solar panel (about 30 amp hours per night), so it is an easy thing to power. Living on solar power is a totally different challenge for some folks than anything they have done before. People that are used to turning lights, TV & computer on when they get up in the morning & leaving them on all day need to think about whether this is really the life for them. If you are financially able to spend the money, it is possible to live like that on solar power, but the reality is that it takes a lot of money. A reality check is in order. If you don’t have unlimited funds, you need to be willing to compromise. One person I met with a five solar panel system that could not keep up with her “needs” summed up her view by saying “I’m not going to conserve. I need my 49” TV (an exaggeration) & I worked all my life so I can live any way I want.” I have run into folks who need to turn ten lights on to feel comfortable, while we are happy with two or three. Face it; many folks who are not willing to change their life & do some conserving would be better off in an RV park & hooked up. I believe that people who want to run their generators all day and through the evening should do just that. Parking fees are cheaper than running a generator, not to mention how the majority of us out here feel about the noise & fumes. I tell people who buy all electric rigs to forget about solar power and go check into a park. The roof is not big enough for the solar panels needed and there is no way to carry enough batteries. In our RV home we have made a lot of little modifications (not all electrical) that add up to a successful off-the-grid life. Some examples: I cut a hole in the ceiling of our bathroom & added a skylight, so we wouldn’t have to turn a light on every time we went in there to wash our hands. We have the water supply to the toilet shut off, except for a hand held sprayer for “you know what” and we save our dish washing rinse water in a jug & use it for flushing. There is a water pipe next to our shower that feeds back into our fresh water tank, so we can run the shower water into it until the cold water in the lines is flushed out. We replaced the big standard size kitchen sink that came in our rig with a small, two compartment RV unit to help save water. I installed a bigger water tank and re-insulated the entire bottom of the rig. I have added all kinds of extra wiring & lighting modifications to help save power. We use a propane “brick” heater instead of the furnace, which saves both electricity & propane. Our furnace vents have been covered for years. Our fifth wheel’s suspension has been jacked up 5” higher so we can get to real boondocking places. We have a 19” flat screen TV, not a 27” or bigger like many new rigs. Our TV takes less than 3 amps, not the 10 or 12 like many of the TV’s I have seen in those rigs. We also have one TV, not two. We CAN run this TV all day if we want. It is about like running two 12V light bulbs. This is how we are able to run all of the other appliances like the coffee maker, toaster, electric iron, etc. and all of my power tools, without owning a generator. Just to give you food for thought; Our TV can run for ten hours on the same power that many folks would use by watching only a two hour movie. We can run our waffle iron on that same amount of power. It is a choice. We could run our rig with only one solar panel (we have 345 watts) if we gave up the appliances & tools and ran the TV only two or three hours a day. In our view, we are not just “getting by”. We can camp anywhere as long as we have sunshine every few days and live a very comfortable life on very limited funds. We are happy to turn the lights off when we don’t need them and we can truthfully say that our solar power has paid for itself many times over (about once per year). Our electricity is free and it falls from the sky in unlimited amounts. If only water & sewer were so simple. Anybody can “get by” with a lot less solar power than the dealers try to sell them. Only you can decide how much effort you are willing to put into conservation, or how much money you can spend if you are not willing to conserve. Suit yourself, but believe me when I say that there is another way. We got up this cloudy morning after two cloudy days in a row boondocking out in the Arizona desert to find the batteries at 12.3 V & the meter saying -127 amp hours. We have been running whatever we want & watched TV, plus a movie last night. I guess we’ll have to start the generator. Wait, we don’t own one! So instead we ran the coffee grinder, Mr. Coffee, toaster & TV & ran down to -150 AH. Yea, we have a 19” TV, not a 27”, but those other things don’t take as much power as the solar dealers tell you. Notice, I am typing this on a lap-top that is plugged in. It also uses less power than you think. We are currently charging at a net +2.5 amps, in the clouds, with the lap top plugged in and a small inverter powering it. We could comfortably go for two or three more days, but the forecast says clear tomorrow. Our system is designed, wired & adjusted correctly. Our batteries were full three days ago, not just nearly full (charged to 14.8V). The majority of the folks you talk to that have solar power (and generators) don’t believe we are actually doing this. Either their systems don’t work, or they don’t understand battery power. The majority is misinformed. We have a neighbor here with more solar power than we have, but who runs a generator every single day. He believes it is the normal way to live and he doesn’t want to discuss it. He is close enough too see our lights on, knows that we have no generator & still believes the majority opinion and the salesmen instead of the obvious truth. Aarrg! A $200 recording “smart” meter like a Trimetric 2020 or a Link is a necessity if you want to boondock on battery power in an RV. It is the water level gauge for the batteries & tells you the actual level of charge. This will tell you if your charger is actually working (converters powered by generators do not) & when to run it. Cover the volt meter with a piece of tape. If you want to go solar, you need to educate yourself. Going into the average RV solar dealer and asking for advice is worse than asking an RV dealer or truck salesman about weight ratings. Are those people living in RV’s & off-the-grid?? Three stage, non boosting charge controllers without meters that actually work cost about the same as pretty, flush mounted non-working gadgets with meters, bells & whistles. Controllers mounted at the batteries work. Those mounted up inside any distance from the batteries and not getting the full voltage to the batteries because of the voltage drop caused by the wire do not work. Voltage is more important than amps, although you do need both. Your chances of getting a correctly wired & properly adjusted solar system installed in Quartzsite (or anywhere else) are very low unless you know what to ask for or have a big budget. Even then, you won’t find anybody who wants to follow up with you & make sure it works. I just helped a friend rewire his rig after it had been “fixed” and a panel that he didn’t need added the prior week by one of those dealers. After they had rewired it inadequately & left the controller 30 feet from the batteries, I measured 13.8 volts at the batteries while his controller was showing 14.7 volts. Yes, I am angry. They either don’t know what they are doing or don’t care. The end result is the same either way. You do not need as many solar panels as those dealers try to sell you. I have many friends that can verify that. You have to find those of us that are successfully running on solar power. There are a few. You cannot blindly believe what someone you have never seen tells you (like those folks on a discussion forum). I know; you don’t know me either. The difference is that I’m talking from seven years of full time off-the-grid boondocking experience and I’m not trying to sell you anything. I’m trying to save you money. Well, I finally did it. I bought a sine wave inverter… a Morningstar Sure Sine 300 to be exact. Why? Well, I hope I didn’t succumb to the marketing hype. I have done just fine for about eight years off the grid in an RV that never gets plugged in, powered totally with solar power and NO generator, with modified wave inverters running everything from stereo, TV toaster, coffee maker & microwave to Dewalt battery chargers and power tools like a table saw. Morningstar because I am very, very impressed with the Morningstar Tristar charge controller that I now own, plus the experience that several friends who have the same controller have had. When my second to last inverter (Xantrex X-power 400) started acting funny & was putting out somewhere over 139 volts I took it to the dealer that sold it to me for his evaluation. He said it was within specs (I don’t think so, that is 20% over 115V) and then said “what do you expect from a $40 inverter?” I said that I expected that it shouldn’t blow up my $300 TV & $200 stereo. Hmmm………….. That got me to thinking. Not too long ago I got a phone call from a friend who had a story to tell about one of his friends who had burned up not one, but two new stereos on his modified wave inverter. Of course, both Sony & Yamaha blamed the modified wave power. I really suspect that it was the piece of $&#T inverter made by Xantrex that is at fault, but who can prove anything??? (Has anyone else noticed where Xantrex inverters are now manufactured?) China, folks. So, I bit it off & spent nearly $300 to run my electronics & battery chargers. What the heck, I can afford it & maybe it really will work better. So far I can see no difference. It doesn’t even draw much more idle current. I suppose newer technology does make a difference. Over the long haul, who can say?? I rest easier though and have faith that my TV & stereo are in better hands. I have been operating under the assumption that enough education given to the consumer would force the RV solar dealers into learning how to do things right. This has worked to a small extent, because I know of one dealer (but only one) who is now using the 14.8V charge set point as Trojan recommends. The rest of them remain clueless & refuse to install correctly sized wire or adjust the voltage correctly even when asked to. They are so mired in the past by their lack of knowledge and conviction that they know better, that the consumer cannot get a working RV solar system installed even when he knows what to ask for. My definition of working is putting all the energy possible into the batteries and charging them until they are fully charged so the power is available whenever it is needed. Most RV solar systems installed by “professionals“ do not work like this and most people who have them are afraid to really use their electricity. I just checked a system (late Jan. 2009) bought by an RV’er who talked to me first and then went to the dealer armed with education. The dealer argued with him on several points and the guy bought from him anyway. He was told that they couldn’t install the #4 cables needed to keep the voltage drop under 3% because it wouldn’t fit in the connectors they use, so he is stuck with wire only large enough for three panels, not the four or five that he wanted to have the capacity for. Then he was told they always set controllers to 14.35 or 14.4V & that the correct 14.8V setting as recommended by the battery manufacturer is too high. Isn’t that kind of like saying that a tire manufacturer who says to put 80 lbs of pressure in a truck tire doesn’t know what he is doing and less is better? Then they told him that they never fuse the input side of a charge controller, even though it is a UL requirement in home solar systems and the manual that comes with the Morningstar controller they installed says to do it because the controller will alarm & shut down if you do not shut the input power off before reprogramming voltage setting. Let’s not even talk about the standard tilting bars that hold the panels up to maybe 40 degrees instead of the optimum 50 degrees, the lack of a ground wire to the lug in the controller and the fact that they hooked the negative wires up backwards in the controller. All this at a cost of only $80 per hour. It would seem to me that anybody who is getting paid that kind of money should be able to give the customer what he asks for. There used to be a saying “The customer is always right”. Well now even an educated customer who knows what he wants can’t get it. Please; don’t support businesses that won’t give you what you ask for. This guy should have just turned around and walked away. Then, there is the other system that I just checked (Feb. 2009) for some folks that had a single panel system installed in Quartzsite. The expensive flush mount, two stage MPPT controller was installed in the refrigerator cabinet with 25 feet of wire between it and the batteries. The dealer used #8 wire because they told him to wire it so that they could add a panel if needed and they thought this was just great. Here is the reality: First, the manual for the controller he installed says to use #6 wire for the length of wire used. I measured nearly a half a volt of drop between the controller and the batteries. This was with the negative wire not even going all the way to the batteries. (He tied it to the frame as close to the controller as he could.) Then he set the controller to 13.8V, which means the batteries will never see more than 13.4V in the middle of the day when the amps are the highest. So, the batteries are going to be running in the middle of their range and probably never get above a 70% charge. This will lead them to sulphation & stratification problems and shorten their life. This voltage drop is only 3%, which you would think is good, but it is in the worst place in the system and when they decide that (of course) they need more power and add that second panel, the voltage drop will double to 6%, which will actually make things worse. Even if they set the controller up to the recommended 14.8V, the batteries will still only see about 14V and they will still never get fully charged. Remember, you cannot just turn the controller up to 15.6V to compensate because it will cause over voltage problems when the amps drop late in the day on the days that you have charged by running the generator or driven with the engine alternator charging. The solution is to simply move the controller to a compartment next to the batteries. Of course, that negative wire has to be extended to the new controller location. It would have been a lot easier and not added any labor if it had been run next to the positive wire like it should have been. This brilliant idea he came up with to cut the expense of the negative wire does not agree with any accepted wiring practices. The positive & negative wires are supposed to be run together and twisted to limit radio frequency interference, but I suppose that doesn’t matter as long as he gets away with it. The dealer will argue that where the voltage drop occurs in the system doesn’t matter (I have had that conversation), but if you take 6% away from the 17V+ the panels can produce, you will see that about 16V will still get to the controller in its new location, which will then regulate it down to the 14.8V that the batteries need and that will actually get to the batteries thru a very short wire. It will also provide the 15.5V needed for occasional equalizing, something that cannot be done as the system was installed. Just by changing the location of the controller, this system will charge the batteries all the way up and take care of them so they will last. One little fact that I need to emphasize is that the extra 6% in higher voltage getting to the batteries gives you six percent more watts into the batteries (and they keep talking about boost). By putting the controller in the wrong location, he is robbing the system of power, as well as ruining the batteries. By selling a two stage controller that tapers the power off instead of continuing to charge like a good three stage controller would, he is robbing the customer of even more power that his panel could produce. His belief in the MPPT marketing is shutting the power off, not boosting it. This dealer is the most respected in Quartzsite, the one with the money back guarantee, but his definition of a working system is not acceptable to anyone who wants to be able to live on solar power. He has been installing systems just like this for years and I keep showing people how to fix them after they figure out that they are not working. One of my friends went back to him & complained last year after I helped him fix a similarly installed system, so he cannot say that nobody has ever told him about this problem. I also had a conversation with this dealer two years ago about Trojan’s 14.8V recommended charge setting and he is still mired in the past and his mind is made up that Trojan is wrong about how to charge their own products. He also still does not install temperature compensation and we had that conversation more than once. Why do the factories build this capability into their controllers if it is not needed? Is this dealer actually stupid? Or, do you suppose he is doing what he does on purpose, especially the panel installations of his that I keep seeing with shadowing problems, because people who need more power go back and buy more expensive solar panels and guess what; his price is the highest in the country! Then, when the batteries don’t last because of constantly being undercharged, he gets to sell new batteries, too. There has to be a profit motive here! By the way, the expensive systems they install with a big MPPT controller close to the batteries do appear to work, but are inefficient because of voltage drop in the wiring ahead controller that needs all the voltage it can get in order to provide that magic boost. #8 wire is not big. Every extra bit of voltage that gets to these MPPT controllers helps them work better. However, I am still convinced that they are a waste of money and do not provide nearly the amount of boost claimed. Now you know why I refuse to do business with or even set foot in most of the RV Solar dealers and why I recommend Backwoods Solar and Northern Arizona Wind Sun as honest suppliers. I have started taking pictures of the problems I find. I sure wish I had started doing this a long time ago! These pictures are going to start to become very embarrassing for a few RV solar dealers. A lot of you folks out there need to install a Trimetric meter and then hot foot it back to the dealer & demand either your money back or free system repairs, using the meter and the information that comes with it to prove that your system doesn’t work! For more information about the meter and properly maintaining batteries take a look at bogartengineering.com (the manufacturer of the Trimetric meter) & read the file about using the meter & battery maintenance. My voice alone hasn’t changed much, but if a few folks would do just what I am suggesting these dealers would be forced to wake up and join the twenty first century. I am posting this in July, 2010 because it has taken me this long to edit it many times as I calmed down. Imagine what the first version read like! Today I tried to reason with a technical service rep at a company that makes charge controllers. I’m not going to name them, but you can figure out who they are. What a frustrating experience! He works for one of those “boost” manufacturers, who want you to believe in the “up to 30% & more power” marketing. The conversation was preceded by one of his dealers refusing to set a “budget” (his word) non-user adjustable controller to 14.8V after being requested to do so by some friends of mine who had a copy of Trojan’s battery charging recommendations in hand. The dealer informed the customer that he would be adding water to his batteries “every other day” if he set it that high and made a show of phoning the controller company to get them to back him up. That controller was factory set at 14.2V and installed with so much small wire between it and the batteries that I measured only 13.6V there, which would never charge the batteries even if the sun were up 24 hours a day. Even worse is that the controller stays at that voltage for only a few minutes and then drops to float, which gets only 13V to the batteries. Even if the installer had followed the instructions that came with that controller and used big enough & short enough wires that kept the voltage drop to 3%, it still would not have worked, only supplying 13.8V to the batteries. Those batteries were quickly being ruined by undercharging. What these “experts” can’t get through their heads is that the small amount of amps from solar charging only works for a few hours per day and getting a battery to the correct voltage and holding it there is the only way to get charged before the sun goes down. If you don’t get a full charge it is impossible to get through the night while using your electrical appliances and the average person interprets that to mean that he needs to buy more solar panels. While this helps the dealers make more profit, it is not the correct answer. The factory guy tried unsuccessfully to explain to me why I should not charge my batteries to 14.8V as recommended by Trojan (and as I have been doing for years) & was unaware that Interstate actually recommends higher. He said 14.4V is where he has his set (in his own motor home) and he equalizes every two weeks, something nobody else does. Let’s see, if his controller shuts off at 14.4V, just how much “boost” is he getting? Trojan says to equalize if you need to, not to make it a regular event. The literature from this charge controller company says that a full wet cell battery will show 12.65V, while mine show 12.85V. My non boosting controller keeps charging way past where his would be shut off, so it gives me more amps, not less. I never needed to equalize until my batteries were six years old, based on yearly hydrometer tests. The above mentioned dealer once told one of my friends not to use a hydrometer to test his batteries for level of charge. I add about two quarts of water to my four batteries every three months. Which of us is right? Neither the factory guy nor the dealer live full time in a solar powered RV & without a generator. The factory guy told me that he owns a motor home with a generator and I’ll bet that it gets used a lot. A few years ago I witnessed the dealer’s wife telling a prospective solar customer how they used a generator to make coffee every morning. That is what convinced me to go out the door and look elsewhere for advice. I never did find an RV solar dealer who could tell me why my system didn’t work. I had to figure it out for myself. I didn’t need more amps… I needed volts. I have made my coffee with an electric Mr. Coffee every morning rain or shine for the past six or more years and I DO NOT OWN a generator. Today our batteries got charged all the way up to 15.1V (temperature compensated on a cold day) and it was partly cloudy. Ask my wife if she was using the iron for quilting, if we ran the toaster, if I was using a power saw earlier or if the TV was on half the day with only 345 watts of solar panels. What do you think? Our batteries are full when the sun goes down and they are healthy, not overcharged. Again; if a tire manufacturer told you to put 80psi in their tires if you wanted to carry their rated load, would you tell them that they didn’t know what they were talking about and that 60psi is better? Really, would you? It is exactly the same concept. Under inflated tires are dangerous. Undercharging batteries will ruin them. My last set of batteries was over eight years old when moved into my storage shed & put into use in a construction power system. They are still working (and yes, they are getting weak). The factory guy bragged of getting seven years use out of some Trojans in a rig that he uses only for vacations. Again; which of us is right? My top of the line three stage Morningstar Tristar 45 amp controller with a five year warranty, that is user adjustable with dip switches, has remote voltage sensing and temperature compensation costs about half what those guy’s “budget” 30 amp boosting controller does, that is not user adjustable unless you spring for the $250 remote and does not even have terminals for connecting a temperature sensor. They set that unit to stay in absorption for only a few minutes and drop to float well before the batteries are fully charged. They claim that it provides boost, while it actually shuts the power off before the batteries are charged. The Tristar is also a lot more efficient than that MPPT device. You can buy an additional 130 watt solar panel for the difference in price, which would work in cloudy conditions, hot weather, etc. when there is NO boost. You cannot connect three 130 watt panels to the budget controller without overloading it, while the Tristar can handle five panels. Which is the best bargain? Take the money and buy a real meter (Trimetric) if you want to be successful with solar power. That solar dealer doesn’t want you to buy one because it would show that the systems he installs do not really work. And, if you still aren’t convinced about what I am saying, read the battery charging information on the Trimetric web site @ bogartengineering.com. I believe you will find that Ralph Hiesey (owner of Bogart and inventor of the Trimetric) and I share many of the same opinions about battery charging and we came to these conclusions having never met or even talking to each other. Ralph lives off grid & knows what he is doing. If you really want your eyes opened call Ralph and ask him if any RV Solar dealer you are thinking about buying from is a Trimetric dealer. They will buy the most over marketed charge controllers, but not the recognized leader in battery monitors. I suppose there are other good charge controller manufacturers, but I really like Morningstar. Their smaller controllers have built in temperature compensation, so even though they are factory set to only 14.4V, they still work pretty well. I use the Tristar non MPPT unit in my own rig and am planning on using their new MPPT model on the shop I am putting up next summer. Morningstar really is the leading manufacturer of solar charge controllers in the entire world, no matter what the glossy literature from those other guys says. Their products work. They don’t use flimsy little potentiometers for adjusting voltage like the other guys and their warranty is better. Their service on the rare occasion that I have needed it has been exceptional. I see no need to look further. If you can’t figure this out for yourself, then go and buy your overpriced, under wired and maladjusted system from those other guys. Then when you have figured out that it doesn’t work you can try to find somebody who can fix it for you. One of those “professional” RV Solar dealers is only charging $110 an hour for repairs. Of course when he is done it probably still won’t work the way it should. I fixed one of his “repaired” systems this winter that still had no temp sensor, too small of wire and was loaded to 100% of the controller’s rating so that it is only a matter of time before it fails. All I want them to do is to join the 21st century & start doing things right. I wouldn’t care if they overcharge for it, if it only worked. My last point: I rewired the system I was talking about in the beginning of this rant and the folks took their controller to a real solar dealer who does off grid homes to get it set up to 14.8V. I saw these folks two months later. They were all smiles because their system is now working. (I saw them again Jan 2011 & they are still smiling!) Their batteries are now healthy and no, they don’t put water in them every other day. Off grid living is great. People keep asking me why I don’t do more updating and then others criticize me for being repetitive. This will serve to address both issues. First, I need to say something: Those who continue to post on the RV Forums that I don’t understand MPPT or that I don’t like it cannot read. I use it when it makes sense and I do know what I am talking about. I own a Tristar MPPT unit that is going to be installed on my own home, so I do know its value on large systems. However, the RV solar dealers still continue to install MPPT with wires so small that it cannot work and when you look at the cost of a good three stage MPPT controller, it is a lot more money. Those of you that think I am wrong about the small MPPT controllers do not understand what the meter is showing you. MPPT does not make monetary sense on small systems. You must look at the extra cost and think about how many watts of solar panels that would buy. The MPPT boost only works during optimum conditions and when battery voltage is low. It will not work at all if the wiring installed between the panels and the controller is too small and it works very little when the batteries are near full. I’m not making this up. Read the specs from the manufacturers. You won’t get any 25% more watts into your batteries over the course of the whole charging day even if the installation is perfect. Don’t even start about amps boost from high voltage panels that were designed as a marketing ploy so it would look like you are getting more boost. Watts is an energy measurement, amps is only half of the whole story. On cloudy days, you actually get less as the MPPT electronics takes away some due to efficiency loss. Then, when your controller shuts off at a voltage set point that is set too low, the charging stops and MPPT doesn’t help you at all. I don’t care what the remote meter says because it is not telling the truth. I have proved this more than once by removing the MPPT controller & installing a non MPPT controller. You have to change the controller out to see this. I even got one of the dealers to do this once and he got all red in the face and started yelling at me when he saw the truth. I’m sorry people, but they really are lying to us. Solar Boost 3024i controller set by the factory at 14.4V, only two feet from the batteries (great), 16ft or so of #8 from the roof to the controller connected for 12V (look that up in a voltage drop chart). This limits the voltage at the controller input terminals to the point that there will never be any boost provided by the MPPT circuitry. No temperature compensator. Measurements: 14.4V @ output terminals (at set point), 13.8V @ batteries and just under 30 amps going in. The hydrometer said the cells were all equal, but near dead. Why? First, there was at least 10ft (not 2ft) of #8 wandering all over between the controller and the batteries where it was connected with a stab-in automotive fuse (the big one) that was hot to the touch (heaters are resistors). I measured .4V loss in the wire and another .4V loss across the fuse. At the temperature while I was testing, the voltage at the batteries needs to be close to 15V in order to actually charge correctly. Those professionals claim they know what they are doing and yet very little changes. 13.8V will not charge a flooded battery even if run all day and night long. Their claims to the contrary are just stupidity. This controller drops to float voltage after two hours, shutting the charge off. This controller is supposed to be able to handle 40 amps output, but that is not what it was doing. Don’t ask me why because I don’t know and I don’t care. A 30 amp controller will put out only 30 amps no matter how many panels are connected to it, trying in vain to protect itself. It will fail eventually. I have seen several that did just exactly that. He should be seeing over 40 amps on cool mornings (that magic boost). He is getting less than 3 panels worth of power for the price of four & at inflated prices. If you were to read the instructions, you would find that the controller is supposed to be sized for output amps, not input. They say to include the possible boost. So, if you took the over 8 amps that these panels put out and added the possible 25 or 30% boost, the controller needs to be sized to handle over 40 amps. Those guys are not too big on reading directions though, and they are not the only ones. There are other RV solar dealers doing exactly the same thing. Blue Sky is giving away a lot of warranty replacements. Listen to me here: The Blue Sky 3024i is a good controller. However, when not installed and adjusted correctly it cannot and will not work. I would never install one in a system that could produce more than 30 amps. My recommendations to the owner: Buy a real controller, Morningstar Tristar 45 with temp sensor ($200) and install a Trimetric meter so he can see what is going on. This controller will charge in acceptance for as long as it takes to charge the batteries, not shut down after a set time. Replace the wire from the roof with at least #6, #4 if using MPPT, and then to the batteries with #4 & shorten it. Also, replace the stupid & lazy connection of the negative wire to the frame using a tech screw with a proper connector to a real terminal on the shunt or maybe at the inverter (very close to the controller). Sell the old controller on Ebay to somebody you don’t know (buyers beware). His alternative was to add a second slaved Blue Sky controller at a cost of over $300 or to replace the 30 amp unit with the SB50 that should have been installed in the first place, adding temperature compensation and setting the voltage up to the 14.8V that Trojan recommends for his T105’s. However, why support a dealer and a manufacture who both refuse to do things right and obviously do not know what they are doing? If he wants to spend money, buy the Tristar MPPT for $250 more and get up to another 10 or 15% energy, but he does not need it. 33 amps or more of charging at the correct voltage & time will fix his problems. Yes, I do have an agenda. It is to stop the fleecing of all of you in the RV community by dealers and manufacturers who are out to take your money. This is the plain truth.